Drag racing is an unforgiving sport. One small mistake can drastically change the outcome of the weekend. Veteran Top Fuel Motorcycle racer and 18-time champion Larry “Spiderman” McBride knows this all too well. 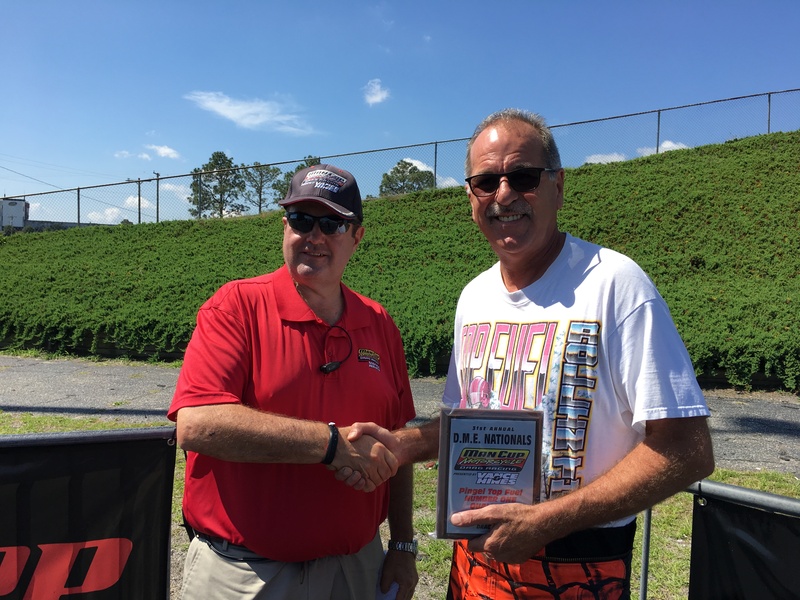 After seemingly gaining control of a scorching hot, challenging event, McBride says minor tuning mistakes cost his team a victory in the final round of the Man Cup DME Nationals from Rockingham Dragway, June 1-3. On a balmy, muggy weekend with track temperatures well above 125 degrees, McBride endured the adverse conditions to put his Trim-Tex-backed “Star” on the pole with a run of 6.08 at 242 mph. The team amassed valuable tuning data on Saturday evening. Crew chief Steve McBride and veteran crewman Roland Stuart strategized on how to best get down the hot launchpad. During his Sunday morning bye run team McBride put all the pieces together and improved to a 5.84 at 245 mph, low elapsed time of the event. Many doubted a five-second run would be possible, given the challenging conditions. 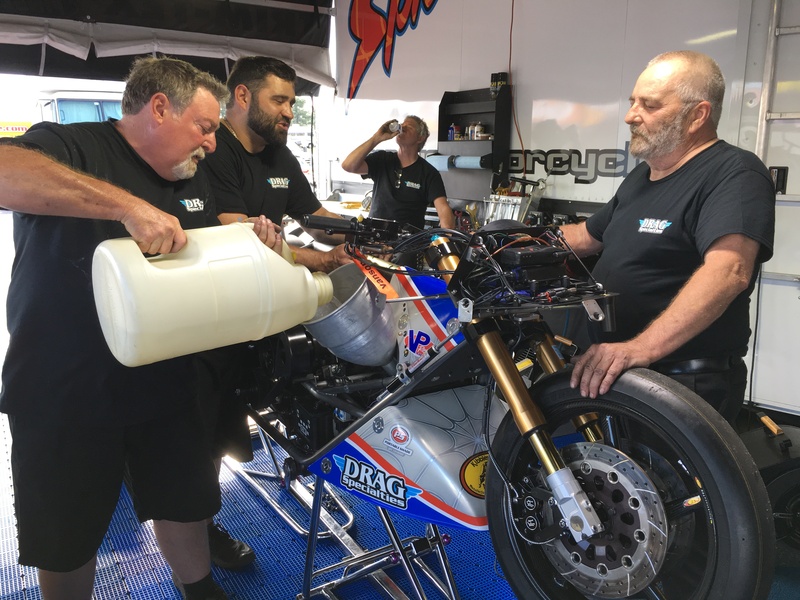 With the sun beating down on the legendary North Carolina drag strip prior to the final, team McBride made changes to the motorcycle in advance of another showdown with point leader Dave Vantine. “We made some chassis and air pressure changes. We changed wheelie bars and took some nose weight off to see if we could get some more weight on the rear wheel. The track was tough all weekend and we wanted to get ahead of it,” McBride said. In retrospect it was a series of changes McBride wishes his team would not have made. “If we had it all to redo again we would have left the bike alone,” McBride said. McBride says, much to the surprise of his squad, the track ended up being better than it was all weekend and the changes to the bike caused the Spiderman to drive through the clutch. McBride was on and off the throttle, shutting off initially at the 330′ mark. 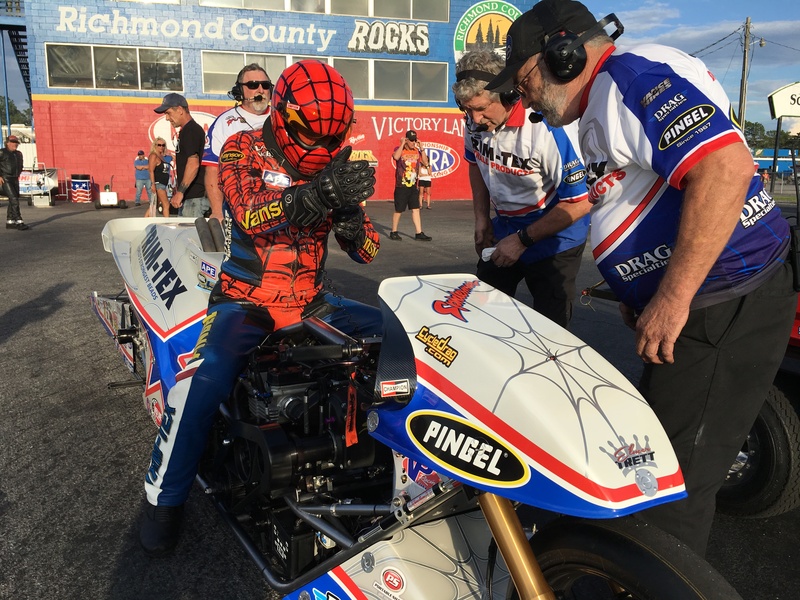 Despite his .034 to .083 reaction time advantage, McBride came just .08 of a second, about a bike length, away from catching Vantine at the stripe, 6.22 to 6.36. McBride commended team Vantine on its second win of the season. “They have done a great job. They took my horseshoe away from me,” laughed McBride. McBride also praised his crew for battling the heat and making three motor changes throughout the weekend. Next up for McBride is a trip to Ohio, July 13-15 for the Man Cup Fast by Gast Nationals at Dragway 42.